The differential splits the power or torque generated by engine to allow different wheels or axles move independently with different speeds. Differential form an imperative component of the vehicles without which vehicles would be difficult to maneuver. Differential assists the wheels to rotate at different rpm via speed reduction at pinion gear assembly, and provides better traction. Differential assemblies consists either of pinion gears, ring gears and spider gears, which are arranged in the form of sun and planetary gears. This specific arrangement entails in providing required speed to different wheels whilst turning. Increase in demand for SUVs, crossovers, compact SUVs and premium cars across the globe is considered one of the major driving factors to bolster the market of differential market in forecast period. According to JATO dynamics by 2020, SUVs are expected to account for more than third of Europe’s new car sales. Growing inclination towards all wheel and four wheel drives integrated vehicles in Asian countries have increased the popularity of off-road vehicles and sports cars. These factors are likely to attribute to the overall market growth during the forecast period. Increased disposable income and spending capacity of the public masses chiefly in the developing region on account of significant revenue opportunities have circuitously raised the demand for vehicles that are forming the critical necessity for commutation. However, high maintenance and repairing cost and electric vehicles with hub motors these factors are likely to hamper the growth of differential market in forecast period. The global differentials market for automotive is expected to grow at a CAGR of more than 5% during 2017 – 2025. Differential market analysis for automobiles is based on four categories: differential types, drive type, vehicle type, and by region. Differential market has been segregated into open differential, lock differential, among others under the purview of type segmentation. The drive type analysis splits the differential market for automotive into two-wheel drive (2WD) and four-wheel drive (4WD/AWD) types. Passenger, commercial and electric vehicles elucidates the vehicle type segmentation. Upsurge in the adventurous activities amidst the youth population have elevated the desire towards compact SUVs and vehicles with off-roading capability. This in turn has accentuated the demand for differential integration thereby propelling the market growth rate. Increased spending capacity along with the declining car loan rates is likely to propel the demand for crossovers and SUVs thereby inflating the demand for differential in the coming years. Open differential held the major share of automotive differential market in 2016. Most of the vehicles are equipped with the open differential due to its low cost and it provides better traction on good condition roads. Open differential has limitations on off road driving. To overcome limitations of open differential manufacturers design limited slip differential to provide better traction in muddy, snowy and off road conditions. Owing to various advantages such simple in manufacturing, cost effective and better traction ability on different road conditions limited slip differential is likely to dominate the automotive differential market in forecast period. The increasing penetration of electronic limited slip differentials (eLSD) has been witnessed in the U.S. The eLSD suffices the necessity of mechanical components with more durability and efficiency. Additionally, it aids in elevating the overall fuel efficiency that forms the primary factor leading towards the adoption of such component integrated into the vehicles. Increased per capita income and customizable financial schemes provided by the OEMs themselves has opened an altogether new horizons for differential’s business growth. Some of the prominent regions taken into analysis are inclusive of North America, Europe, Asia Pacific, among others. The regional analysis is done on the basis of the production trend, political reforms, regulation changes and society demand. Asia Pacific and Latin America has shown tremendous growth in automobile sector over the past few years because of emerging economic conditions, increasing population, increasing per capita income, easy availability of finance, decreasing car loan interest rates and degree of urbanization. Crucial players in the differential market are expected to benefit from the formation of strategic alliances with global players in the differential market. The market is burgeoned with some of the key players that have strong global presence and firm establishments which are equally coupled with wide product portfolio. Prominent players in the differential market are ZF Friedrichshafen AG, Eaton, BorgWarner, Schaeffler, GKN PLC, JTEKT Corporation, DANA Limited, and Drexler Automotive GmbH, Neapco Inc. For expanding business globally companies are focusing on merger and acquisitions with the regional automotive differential manufacturers. BorgWarner is one of the major manufacturers and has expertise in manufacturing of front cross differential technology. Despite of holding a small share as compared to other major manufacturers BorgWarner holds a prominent position in the differential market for vehicles. The report comprises a detailed value chain analysis, which provides a comprehensive view of the global differential market for automobile. Porter’s Five Forces model for the differential market for automotive has also been included to help understand the competitive landscape in the market. The study encompasses market attractiveness analysis, wherein end-users are benchmarked based on their market size, growth rate, and general attractiveness. The study provides a decisive view of the global differential market for vehicles by segmenting it in terms of type, vehicle, and region. These segments have been analyzed based on present and future trends. Regional segmentation includes the current and forecast demand for automotive differential in North America, Europe, Asia Pacific, Latin America, and Middle East & Africa. The report also covers demand for individual application segments in all the regions. The study includes profiles of major companies operating in the global differential market for automotive. Key players in the differential market for automotive include ZF Friedrichshafen AG, Eaton, BorgWarner Inc., Schaeffler, GKN PLC, JTEKT Corporation, DANA Limited, and Drexler Automotive GmbH, Neapco and others and others. Market players have been profiled in terms of attributes such as company overview, financial overview, business strategies, recent developments, and SWOT analysis. The market for automotive differential is primarily driven by rising demand for eco-friendly vehicles. The report provides the estimated market size of automotive differential for 2016 and forecast for the next nine years. The global market size of automotive differential has been provided in terms of revenue and volume. 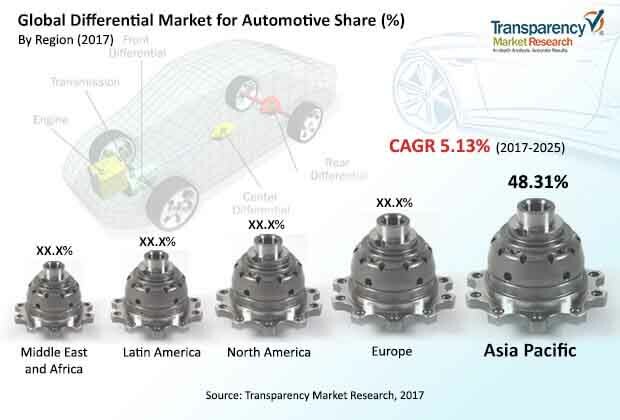 Market numbers have been estimated based on key differential type, drive type, vehicle, and regional segments of differential market for automotive. Market size and forecast for each major type and vehicle have been provided in terms of global and regional/country markets.